A close-up view of the half-inch flowers of beechdrops, a small native plant that is parasitic on the roots of beech trees. This plant blooms under beech trees at this time of year in Westborough, but at other times it looks like a bunch of twigs. Officially it’s now fall, a wonderful time for discovering curious things in the woods. Not only can you find mushrooms and other fungi in all the colors of the rainbow – try looking for them – but you might also spot an odd plant among the usual ones. Plants are green and make their own food, right? Well, maybe not quite all of them. One curious-looking exception is a small native plant known as beechdrops (Epifagus virginiana). It’s easy to overlook because it looks like a bunch of bare twigs – or a dead plant. But if you catch it at the right time – in bloom in September or early October – you’ll see its flowers. They’re small, tube-like flowers striped with red or purple. The plant itself usually grows only 6-20 inches tall. Most of the time, this plant looks like a tiny bare bush. It’s brown or tan and has no leaves and no green color. How does it survive and even thrive? Instead of making its own food (through the chemical magic of photosynthesis), it’s parasitic. It doesn’t need green leaves to capture energy from sunlight. Instead, it taps into the roots of other plants to get the sugars it needs. It doesn’t tap into just any plant. As the name beechdrops suggests, it latches onto a grand, large, long-lived plant, the American beech tree (Fagus grandifolia). These magnificent trees grow tall – 80-120 feet high – to capture plenty of sunlight, and the parasitic little beechdrops plants that grow at their feet have no problem surviving in the shade that they cast. Beechdrops uses its own modified, thread-like roots to tap into the beech tree’s roots. 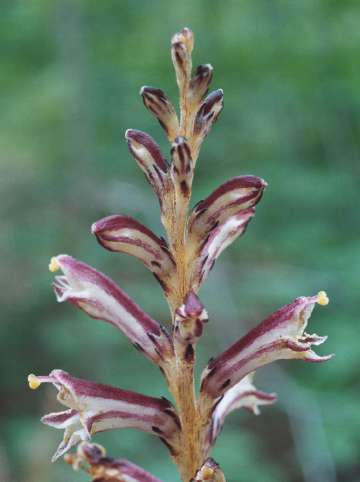 When it blooms around this time of year, beechdrops produces two types of flowers – the regular flowers that open, which are shown in this week’s photo, and smaller, bud-like flowers that never open. These bud-like flowers are the ones that produce seeds. They contain both male and female parts and fertilize themselves, so beechdrops doesn’t need bees or other pollinators. What’s the best way to find beechdrops in the woods? Find an American beech tree. Beechdrops can’t live without beech trees. Look for the smooth, gray bark of the beech trunks, which remain smooth throughout the tree’s long life span of up to 360 years. (Don’t confuse beech trunks with maple trunks, which are gray and smooth until the maple gets older.) Beeches are the trees that people are tempted to carve their initials into – a bad idea, because the wounds in the thin bark allow fungus and other disease to enter. In the fall, look for beech foliage, which turns yellow, and then fades to tan, and finally to almost white. The leaves are oval and some of them often stay on the trees, especially young trees, throughout the winter. In winter, you might also notice the leaf buds on the tree. They’re an inch long and sharply pointed, like little spikes. When you find one beech tree, you’re likely to find others, since beech roots support more than the little parasitic beechdrops. New beech trees sprout as suckers from the beech roots. These new young trees are genetically identical to the parent tree. This way of spreading via root suckers helps beech trees to spread and start a grove in a favorable location. Genes that work well in one spot will probably work well nearby. Trees that grow from seeds, in which genes have been recombined and shuffled, might not succeed as well in the same place. It’s a good year for beechdrops along this trail. You might even find beechdrops growing right out in the middle of the trail. Look especially from the mid-section of the trail to its far end, where you approach a power line cut. Don’t forget to keep an eye out for beech trees and beechdrops elsewhere in Westborough’s woods. Beeches are one of the dominant trees in the forests of eastern-central Massachusetts, although they seem less numerous in our area than other dominant trees such as oaks. Have you noticed that we are fortunate to have a considerable variety of trees in this part of Massachusetts? One reason is that our forests are “transitional” between the types of forests in northern New England (much of Vermont, New Hampshire, Maine, and western Massachusetts) and southern New England (much of Connecticut and Rhode Island). Like the cooler, more northern areas, we get maples, birches, and beech, as well as white pine and hemlock. Like the warmer, more southern areas, we get lots of oaks and hickories, which disappear farther north. Native Americans were familiar with beechdrops and beech trees and found uses for both. They drank a tea made from fresh beechdrops to treat digestive troubles, such as diarrhea and dysentery, as well as sores in and around the mouth. Beech trees supplied beech nuts, which they roasted and ate, ground into flour, or used to make a hot coffee-like drink. Native Americans chewed beechnuts as a cure for worms. They washed frostbite with tea made from beech leaves, and also used this tea on burns and poison ivy rash. Beech nuts are popular with animals, including red and gray squirrels, chipmunks, flying squirrels, raccoons, porcupines, bears, blue jays, wood ducks, grouse, wild turkeys, tufted titmice, and rose-breasted grosbeaks. The squirrels, chipmunks, and blue jays often bury or hide the nuts, helping to plant new beech trees. Interestingly, beeches that grow from seeds (instead of from root suckers) often do better under other trees, such as sugar maples, than under the parent beeches. To find out more about the interesting bounty of our fall woods and fields, plant to attend WCLT’s “Fall Foraging” on Saturday, Oct. 24, 1-3 pm, with Arthur Haines of the New England Wildflower Society. Meet at St. Luke’s community gardens, near the northeast corner of St. Luke’s cemetery off Rte. 135. And enjoy the autumn woods!